It isn’t always economic data or company-specific announcements that drive the investment markets. Sometimes it’s simply the daily stream of geopolitics, feast, famine and war that captures traders’ minds, catalyzing an almost animal instinct to sell, or buy, rather than analyze. At Braver Capital, we analyze first and re-analyze second. To us, much of the daily news is noise, not signal. Our view remains that the fundamentals (earnings, interest rates and economic data) show we are still in an economic expansion. Yet recent non-market events have driven a new burst of frantic trading, leading to increased day-to-day volatility. And while volatility (about which we’ll say more below) is not only likely to persist but increase on trade-war concerns, geopolitical tensions and the midterm elections (regardless of which side prevails), a heightened level of volatility is not a new normal but merely a return to the norm. For the year through Thursday, the Dow Jones Industrial Average has returned 4.5%, while the broader S&P 500 has gained 5.1%. The MSCI EAFE index, a measure of developed international stock markets, is down 7.4%. As of Thursday, the yield on the Bloomberg Barclays U.S. Aggregate Bond index has climbed to 3.58% from 2.71% at 2017’s end. On a total return basis, the U.S. bond market has declined 2.3% for the year. After a prolonged absence, stock market volatility is back. Last week, the Dow fell 1,377 points over two days. We also experienced a 548-point up day this week. At a casual glance, these moves may appear outsized, but with the Dow in the 25000–26000 range, triple-digit and even quadruple-digit changes should come as little surprise. And those closing numbers don’t even fully reflect the volatility experienced throughout the day. For a look at today’s markets, let’s consider the broader S&P 500 index. Through Thursday, we’ve seen 11 days this year when the stock market closed up or down by 2% or more from the prior day’s close. We haven’t seen that many 2%-plus moves in a calendar year since 2011, when it happened 35 times. Those are closing figures. What about 2% intraday moves? This year, there have been 12 days when the S&P moved 2% or more during the trading session versus none last year. That’s right, zip! This is not normal. Looking over the past 57 years, there’ve been, on average, 41 days a year with 2%-plus intraday swings. Even that average is a bit misleading, though. Only seven years out of the past 57 had between 30 and 50 2% days. So volatility doesn’t tend to fall near the average. 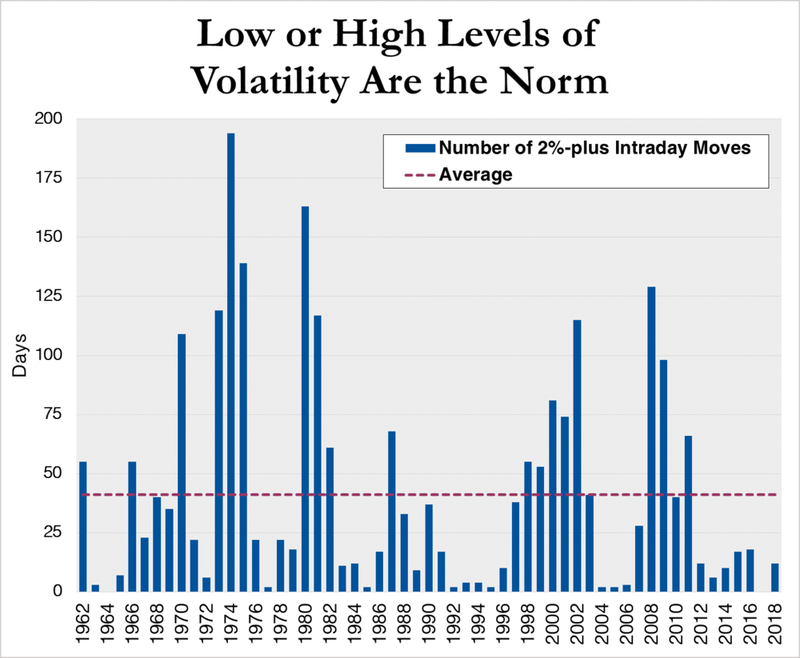 More often than not, we either have very little volatility or a lot of it. A really volatile year can see greater than 100 instances when the stock market moves up or down by 2% or more during the course of a six-and-a-half hour trading day. Note: Chart shows number of days per calendar year that the S&P 500 index experienced intraday swings of 2% or more; 2018 data through 10/18/18. Source: S&P Dow Jones Indices. Clearly, we’ve been in a period of calm, but it’s a calm that’s slowly giving way to less tranquil markets, even as U.S. stocks are still near record highs. If the recent declines have had you on edge or kept you up at night, or the large rebounds have had you feeling euphoric—all in the span of a week or so—that may be a sign that there’s too much risk in your portfolio. If you want to talk it over, we’re always here to discuss it with you. While investors often focus on the stock market, the last year has seen big changes in the bond markets. With interest rates on the rise and bond prices declining for the first prolonged period in years, we’re hearing more people question why they should own bonds at all. Do bonds still have value as portfolio diversifiers if they are losing money? The short answer is yes, because the losses typically are followed by above-average gains. Bond market investors should welcome higher rates, as the income they’ll earn will grow, offsetting price declines. A historical perspective should help explain our reasoning. Since 1926, there have been only 11 calendar years when intermediate-term U.S. government bonds lost money. Over nearly a century, the worst loss was the 5% decline in 1994. Contrast that with the 37% decline for stocks in 2008, and it’s perfectly clear that a bad year for bonds just isn’t that bad in absolute terms. Note: Chart shows calendar-year returns of the IA SBBI U.S. Intermediate-Term Government Total Return index; 2018 return is through 9/30/18. Sources: Ibbotson Associates; Morningstar. This may be a surprise to some given the media’s dire warnings about rising interest rates, but consider that from 1971 through 1981, even as the yield on the 10-year Treasury bond rose from about 5.9% to more than 15.5%, bonds delivered positive returns every single year. They remained in the black even when interest rates were on the rise, demonstrating that bonds can continue to serve their primary role in most investors’ portfolios as an offset to the risks taken in the stock market. Bonds have a long history of delivering positive returns when stocks fall. Since 1929, there have been 24 calendar years when large-cap U.S. stocks dropped in value. 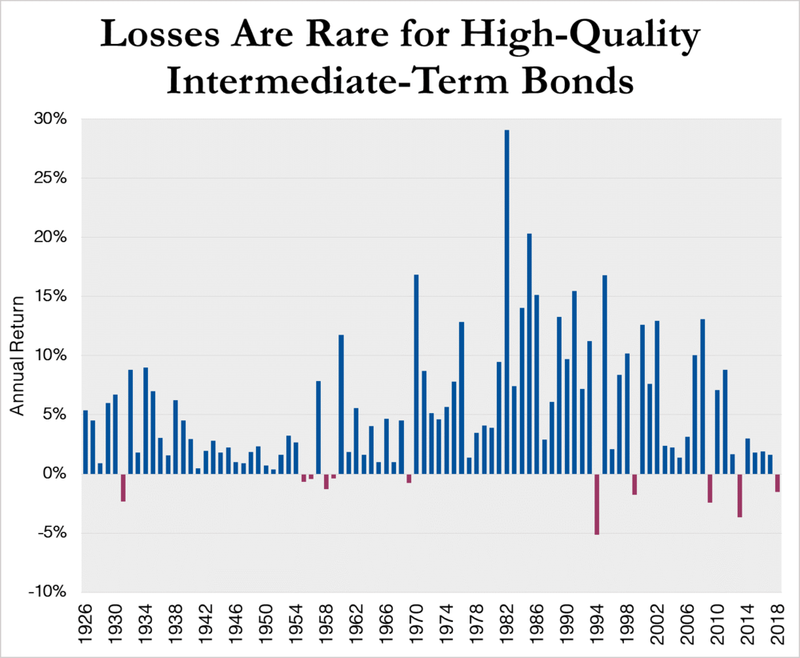 High-quality bonds delivered positive returns in 22 of those 24 years, with a 6% average gain. Note: Chart shows stock and bond returns in years when stocks had negative returns. “Stocks” and “Bonds” are represented by the IA SBBI U.S. Large Stock Total Return and IA SBBI U.S. Intermediate-Term Government Total Return indexes, respectively. Sources: Ibbotson Associates; Morningstar. Of course, it’s not all rainbows and cotton candy for bond investors. The real risk for any fixed-income investor isn’t rising rates, but inflation. When prices of goods and services rise, your purchasing power declines. As a result, inflation can have a big impact on the “real” value of bond (and stock) investment returns. That’s not where we are right now. Inflation ran as high as 14% during the aforementioned 1971–1981 period. At last report, inflation is at 2.3%, and the prospects for a rapid run-up are pretty small. Today’s bond investor might be wary of inflation, but they absolutely shouldn’t fear rising interest rates. As noted, they should embrace higher rates for the growing income streams they will produce over time. Bonds remain a terrific buffer for volatility in a stock-focused investment portfolio. We’re gearing up to host our fourth-quarter webinar, Don’t Give Up on Diversification, which will feature commentary from Portfolio Manager Steve Johnson and Chief Investment Strategist Charlie Toole. The event goes live on Wednesday, October 24 at 4:00 p.m., EDT. Please click here to register—and if you can’t make it on Wednesday, an on-demand replay will be available following the event. We hope you can join us! Next week, third-quarter earnings reports could dictate how traders react to event-driven news. We’ll also see gauges of national economic activity from the Chicago Fed, reads on manufacturing and the service sector, durable goods orders and the Federal Reserve’s Beige Book of anecdotal reports on the economy from around the country. Next Friday, we’ll get our first look at third-quarter economic growth. Please note: This update was prepared on Friday, October 19, 2018, prior to the market’s close.